Searching for the Scooby Doo background music has been a project and a half. 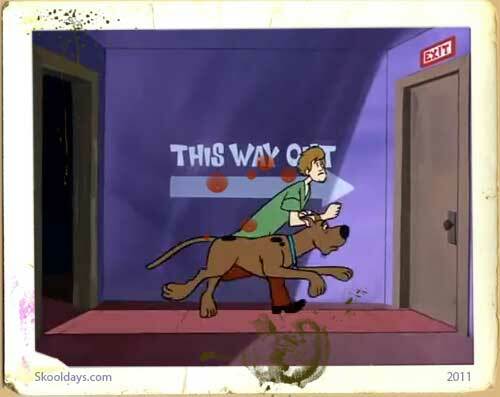 I notice that like me, the internet is full of retro cartoon fans wondering why Hannah Barbera have never released the great background music from the early 70s Scooby doo episodes. We are not talking about the Scooby Doo theme tune as this is widely available, im refering to the background music that is often heard in the middle of an episode. It apears there are several, but one stands out and is normally the tune played when they discover a vital clue or Thelma starts to explain something to the gang. One fan asks “Where Can I Get The Background Music From Classic Scooby Doo?” on Yahoo! Answers and the only answer is itunes. Talk about no answers! I’ve approached this a real project as it appears it just doesn’t exist. There is a great Hanna Barbera sound CD collection and a release of many of the classic Hanna Barbera cartoon titles including Scooby Doo and Top Cat. It became clear that it’s known as an “Underscore” not “Background music” as the definition of an underscore is Music that provides emotional or atmospheric background to the primary dialog or narration onscreen. Some progress – it’s known as a Scooby Doo Underscore ! I then decided to hunt on your tube using this search term but it appears once again, no one has it. One person spoke of giving their rand hand to get the background music. Personally I think it would make an awesome ringitone on my phone. I noticed that there are many episodes on youtube, so i suppose i’m at the point where i now ask if there is anyone out there who knows what this underscore is called. Whether it has ever been made avaialble to download. Who produced it etc. This entry was posted in Cartoon, Movies and tagged 1960, 1970, 1980 by Skooldays. Bookmark the permalink. I only know that this underscore was composed by Ted Nichols. There isn’t any feed anywhere about where we could find it, I’ve searched for it many times. The underscore was remixed in the movie “Scooby doo and the Legend of the Vampire”. I’ll see if i can locate the remixed underscore in the movie “Scooby doo and the Legend of the Vampire”. You don’t happen to know which part of the movie by any chance? The whole soundtrack of the movie is based on the original underscore by Ted Nichols. This guys here http://youtu.be/EMtuPwjXC9Q has a great collection. Check them out; he’ll upload more! I have a collection of 46 cues from the original Penelope Pitstop/Scooby Doo Where Are You 1969 scoring sessions. Your original youtube link is dead so I can’t verify, but I’m pretty sure this is what you’re looking for; it’s a stupendous collection. Send me an email and I’ll send you a link. I would love to have them. Please send me the the link sir. Crap, I’m over a year late, but if you just happen to still have them, could you please send them to throwapplesauce@me.com? I would be forever in your debt! Hi Dan, as everyone else, ive been scouring the net for Ted Nichols original score and come across your post. I would be so grateful for links to your scoring sessions. Thank you so much. I hope its possible. Me too! If anyone has it, please, please send me, I would be very grateful !!! Hello there! It seems that the interest rate is steady. If you happen to have the underscore still, or someone else could help out, I would greatly appreciate a generous email! My email is: Lelandm13@gmail.com. Hey Dan/everyone, this message is a little late haha, but if you or anyone could send me the Scooby Doo cues that would be crazy dope. alberticemo@yahoo.com. Thank you! Wondered if you could get in touch (kristianstclair(at)hotmail.com), I have been in contact with Warner Brothers to do an official release of this music and they keep telling me there’s not enough usable assets to do a release, which I don’t think is true. Sounds like what you have might help refute their claims and move the project along! Composer Ted Nichols is also supportive of this effort. Hi, are you still sending this out? My email is videomaster931@gmail.com. Thank you in advance. Hi Dan. If you’re still offering the link to the underscores of Scooby Doo, would you kindly send it my way? Thank you. Just found this blog and I would love the scooby doo underscore cues if you still have them. It’s so amazing that you have these. You may be the only one! I would really like a link to these cues too. Could you please send a link to me at thatsmilk@gmail.com? I saw your post from the Bedhead Bernie video, “TV Underscores”. I would love to see the collection. I would love these cues if anyone could share them with me please!!! Hi Dan, half a decade later and you’re still getting replies. Could you send it my way as well? I know it’s been years. But if you could send me those files at charlierw123@gmail.com, that’d be just lovely. Hey Dan. I came across this page today and I’ve been looking for these underscores for awhile now. Think you could send them to me at Blueblur5321@aol.com ? Hi Dan – and anyone else who has them – I too would love to hear the music cues without sound effects and speech on top of them. Older cartoons like Scooby Doo had such care put into them, with real studio musicians. Yes, the music cues were repeated ad nauseum, but they were of sufficient quality that one did not tire of hearing them. Hope someone out there has this music! I would like to have them as well. Please send me a link, sir, or whoever else has the music. I would appreciate receiving the cues or a link to them as well, thanks so much! Were you able to locate the original underscore cues from Scooby-Doo (1969)? I would love to be able to get those Scooby Due underscore cues as well if at all possible. I’ve been hunting high and low (and all places in between) for various Ted Nichols underscores. I’m aware from dim and distant memory that some of the Scooby cues came from The New Adventures of Huckleberry Finn, which I haven’t seen in ages. I wish Hanna Barbera would release a sequel to Hanna Barbera’s Pic-a-Nic Basket. As great as it is, it hardly touches upon their sixties adventure series. There is only a small amount of Jonny Quest underscore, and not one bit of underscore from Scooby Doo, or Space Ghost, or the Herculoids, or Fantastic Four (not even the title score for those last two shows). I’d love to know where Hoyt Curtin ends and Ted Nichols begins. I heard one bit of underscore from Jonny Quest that seems to be the basis for the Space Ghost theme, and since Ted Nichols wrote that, does it mean he also did some music cues for Jonny Quest. If so, he really should be getting proper recognition. It would be great to get some of Nichols terriffic underscores. I’d hate to think that I had missed the musical boat for the third time in as many weeks (learned too late that underscores from six Republic Serials, including Captain America had been available in the late nineties, and early part of this century -they still exist but are now in a music library and are unavailable. Also learned that the underscore from the first season of the sities Spider Man had been available, but are no longer available , although some of the second season music is available on iTunes on two volumes called “Spider Sounds” as part of a British music library. Blimey!). At least I was pleased to learn that the George Reeves Superman underscores from the first four seasons are available. Sorry all – didn’t mean to tease you! Lost my original email address after I posted my note in 2013, so I never actually received emails with your replies/questions. Just got the old email address back online and saw that there’s been some interest. Will reply in due course. But hold tight: if there’s any chance of aiding an official release, I’m inclined to not start spreading links around. Hey Dan, glad to see you’re still around! Dan, if possible, I would also greatly appreciate the link. THANK YOU SO FRIGGIN MUCHO. Also, I don’t think there will ever be an official Scooby-Doo “Underscore” release. P.S. Send it ASAP, please and thank you. But mostly please. Any news on sharing these? I see it has been a while since the posts were written, and I’m also interested in downloading these scores. Hey guys, I found a CD at a record shop yesterday. It’s called “Scooby-Doo The Original Session Masters by Hoyt Curtin”. It’s friggin amazing. I’ve been looking for a Scooby CD with underscores for years. This CD has 42 tracks and runs about 44 min. I’ve attached a link to someone else flickr picture of the CD cover. I don’t know where this CD came from. It has no date or year on it. Just has some WB logos and some warnings on it. It’s NOT a CDR. It’s officially pressed with minimal art work. The quality of the music is outstanding. NOT some music thrown together where you can hear the occasional SFX or VOX. You do hear Hoyt or Ted count off the beats at the beginning of a few tracks. Again, I have no idea who or what company made this CD. Can someone help me? If you do this, I’ll find a way to spread it through the internet! Is there any way to get a copy? It seems impossible to find on the Internet otherwise. Could you please send me a rip of the CD? Like others before me , I’m also searching for those Scooby Doo’s old music ! gabriel DOT smash@hotmail com , it would be so amazing !! Hey Glen, I realise this was a while back but I’m one of the growing number of people who would give their right arm for this music. Any chance of a copy/link at all? It would be for personal listening pleasure only. Also, I’d love to see some pics of the CD if you have any? Do you have an MP3 copy you could share with me on Google Drive? My email is shawnmulligan87@gmail.com thanks!! Another lost soul who has been waiting for Ted Nichols’ scores. Please send me the link to richardcartoons@gmail.com. Much appreciated. Can anyone help me get access to this stuff? Relevant link would be brilliant. If anyone can help – and it’d be much appreciated – could you send to matthew.pardo@hotmail.co.uk thanks in advance! Is that Underscore link still floating out there somewhere? I’d love to use these for my costuming group during events and parades! It would be nice to have a variety of tunes from the show as opposed to the theme over and over. If anyone on here could send me the link or files, I’d really appreciate it! THANKS! Any one who actually has it please send it to slaiyfershin@gmail.com please! Scooby Doo has always been a childhood favourite of mine. Thank you in advance. I’m honestly beginning to think no one has this official recording because no one has ever come through with a link or any other evidence that proves otherwise. If it IS the case that someone has a copy of the underscore of the original Scooby-Doo, Where Are You?! Please, please! Contact me!! It ain’t no hoax…I’ve been sitting on it because I’m interested in developing an actual release of the material (I run a small reissue/lost-and-found record label called Squirrel Thing). Glen’s CD find could be key to locating the masters and key rights holders. The track names were blank when I found the material, but luckily you can hear the slates before most of the takes…so that’s how I derived the track names. It’s a combination of cues for Scooby and Penelope Pitstop, presumably from 1969. I suspect that some of the cues were reused for each show (and possibly others). Thanks Dan! Sounds wonderful! I’ll be first in line to buy the cues in any format. Dan, since you run a small record label, wouldn’t you be able to re-release the material in physical form anyway? Or are you talking bigger scale? I can contact Cartoon Network to see if anyone would be able to help us out. I know how much we all want a large-scale release and I know that you will not link the whole CD until you’re 100% sure there won’t be an official release. So the least I can do is get in contact with CN, right? I will contact CN soon and I will email you as soon as I hear back or if it can go further with them, I will go further. We’re so tantalizingly close! I appreciate you looking into this. My fingers are crossed! Could you give us an update about the work for the CD? I’m not sure if you’ll see this since this entire comment thread is flooded with people asking for links, but if you are actually sending the link to some people who ask, I’d appreciate it if you could send it to me at nupane4sale@gmail.com. If it makes any difference, I can assure you that I wouldn’t risk getting anyone in trouble by spreading it around, I’m just interested in this for private use, since I’d just like to listen to what you have. I’m sure I’m missing something, but is this what you’re looking for? Ah actually, on second listen I realise these are ripped from the audio of specific episodes. Well I’m certainly interested I finding decent quality versions! I would love a copy of the underscores, please. If either these cues or the tracks of that CD do get released, could someone please clue me in as well? Even if it’s just to announce an official licensed release rather than actual files, I’d still greatly appreciate being in the loop on this. I would really love to hear the old underscore with clean audio. I’ve been searching for it for some time (but not as long as some people here I’ll admit). Hearing the first track in such good quality (and the man who I presume was Ted counting at the start) made my day! Hi folks! I could lend a hand in recovering/working the Audio – I have a mastering studio. The underscores are what made the show so memorable for me when I was a child. If Dan or anyone else could send on a copy I’d be eternally grateful. Me too! Love that the posted track on Dropbox is AN ACTUAL LIVE BAND. Please send it over, if possible. Could I have a copy too please! The underscores are my childhood, I watched scooby doo on repeat!! I just recently started searching for these underscores, and I found this whole thread for it, I would love if at all possible to get MP3s of the underscore or if the CD has been made available, i would love to buy a copy. If you have any info my email is graverune7177@gmail.com. Thank you for any help! Hello! I’d love them too! My email address is drrichday@gmail.com Thank you! Hi. Yet another ‘ditto’ from me. I would love to hear the Scooby Doo underscores/cues. I’m a little new to the party, and I don’t mean to put any stressful weight on your shoulders, Dan. But I too have been very curious and anxious to hear the background music and underscores for myself. I know you might be busy, and banking on the hope that someone might reach through to Warner Bros, or Cartoon Network about coming up with some kind of re-release deal, but if for some reason you should see this and reconsider, I’d very much appreciate if you could send them over! As with the others, I found this page searching for the Scooby-Doo: Where Are You Underscore. It’s my favorite toon back from the childhood, so if there a possibility you could share the cues with me it would be just amazing! By the way, thank you for your hard work on trying it to get released officialy. I hope Warner Bros. will do it sooner or later. I’m not sure if I’m too late, but I would be most grateful as well for the cues. Ted Nichols is an incredible talent. Hi there! Has me in high spirits seeing so many requests for said underscore keep coming in! I’d like to add my own request of the compiled underscore cue. Hopefully, the comments are still being checked! If this forum is still alive, I would hugely appreciate the links as well! I’m glad to hear that other people love the cues as much as I do. And in case any one else is interested, though they’re very different, check out the OSTs for the Scooby Doo – First Frights game and the Scooby Doo – Spooky Swamp game. This guy is doing a great job of getting us close. Dropbox link for all of them. I too would love the Scooby Doo and Penelope Pitstop underscores! Hi guys, big thanks to everyone trying to get the underscore released! I noticed one of Dan’s links is dead, is there still a working link for the collection of cues? If there is and someone could send it to me at ruairidhmuncaster@hotmail.co.uk that would be fantastic! I’m an amateur audio producer with experience in audio restoration — would love to get my hands on these cues & give them a makeover! If anyone still has the leaked Nichols sessions, please email me (PigmaskColonel@yahoo.com). Very interested in this subject. Please send it my way as well! Brings back great memories! Hello everyone. I don’t know how often this forum is checked, but if by some chance someone sees this, I’d also like the underscore sent my way.